Crewel Work Company Kit Winner! Thanks to Phillipa, of course, for offering the kit as a give-away! 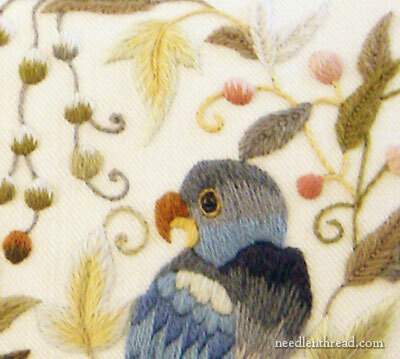 The Mellerstain Parrot kit is marked down £10 (£69 instead of £79) through the month of September. I know for those of us in the US, shipping is often a shocker, so here’s a thought: if you have stitching friends who are interested in Crewel Work Company kits, you might see if you can pool your order and divide up the shipping. It helps! And it just so happens that there are some shops in the US that carry a few of Phillipa’s kits. Nimble Needle, for example, has four of them – the Elizabethan Oak Apple Tree, the Royal Chelsea Crest, the Secret Squirrel, and the Tulip Tree. I know it was a hard question, asking you what your favorite crewel kit on Phillipa’s site is, but it’s such a nice give-away, that I thought you really should have to work a little bit for it! As I mused over all your comments and pondered over your likes (and dislikes – I laughed when someone mentioned a favorite because it didn’t have “pesky creatures” in it! ), I concluded that I really had set a hard task. So I decided to put myself to the test to see if I could similarly narrow down a favorite and say why I like it. But it wasn’t easy to narrow the answer down, so I admire your fortitude in doing so, and appreciate your taking the time to do it! Thanks to one and all for participating! The Winner of the Mellerstain Parrots! Yeah, yeah. I know! Get on with it! Congratulations, Kristel! Please drop me a line with your mailing address! Thank you to all for participating, and stay tuned for future fun give-aways here on Needle ‘n Thread! September 8, 2012 Don’t Forget and Coming Up! G’day Mary, and Kristel, a big congratulations you lucky ducky! How you’ll love to get this kit in your hands. Well done to you Kristel, Mary and of course, Phillipa. It was a very special thing to do. Oh, how exciting! Thanks so much Phillipa and Mary! Congratulations Kristel C! And many thanks to Phillipa Turnbull who was so kind and gracious, even phoning me to make certain my order from her company was done right when I ran into trouble on the website. What a wonderful giveaway and embroidery. I look forward to my Jacobean Long Pillowe. Previous Previous post: Don’t Forget and Coming Up! Next Next post: The Thread Hog!